Worn for less than a total of 100km. Just to long on my short legs! The knee pads where like shin guards on me! 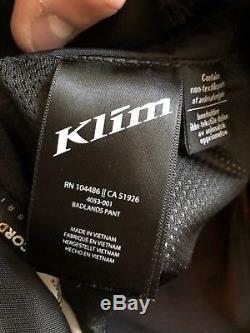 Klim Badlands Pants Perfectly partner to the Badlands Jacket and your dream journey, the Klim Badlands Pants provide comfort in all-conditions due to Klim's legendary dependability. Engineered to ride all-day and every day, the Badlands Pants incorporate a matrix of materials designed to fit your riding position and needs seamlessly. From aggressive, over-the-front off-road two-track stages to wide-open asphalt, Klim has refined the Badlands for a premium tailored fit across the board. Robustness comes from a full suite of D3O and Poron XRD armor components followed closely by the most abrasion and cut/tear resistant Gore-Tex fabric technologies available. Comfort and real durability on demand for any ride, any time, anywhere. Features: Improved comfort and fit Gore-Tex 3-layer pro shell material on main body reduces weight without sacrificing durability/weatherproofness Gore-Tex 3-layer pro shell with Cordura 840D on lower legs for increased durability Gore-Tex 3-layer pro shell talisman Superfabric abrasion-resistant material on knees shrug off abrasion Gore-Tex 3-layer pro shell Armacor material on seat area provides outstanding abrasion and tear resistance Poron XRD premium impact foam tailbone coverage. 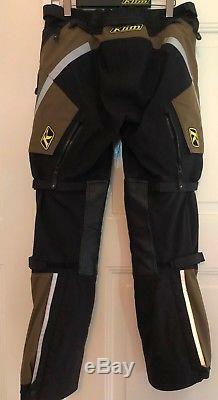 Jacket to pant zipper has been standardized (40cm) which enables you to zip different pants and jackets together TPU molded zipper pulls VT10 YKK Vislon Aquagard water resistant zippers VELCRO® brand fastener adjustment at sides of knees to cinch down knee armor Refined armor placement and exterior adjustment straps keep limb armor in place Exterior Features: Guaranteed To Keep You Dry Gore-Tex 3-layer pro laminate technology Gore-Tex pro laminates, the most breathable, most durable motorsports shell construction available High-mobility active fit patterning for unmatched comfort Gore-Tex 3-layer pro shell material on main body Gore-Tex 3-layer pro shell with Cordura 840D on lower legs Gore-Tex 3-layer pro shell talisman Superfabric abrasion-resistant material on knees Gore-Tex 3-layer pro shell Armacor material on seat Soft Italian full-grain leather inner knee/lower leg exterior 3M Scotchlite industrial grade reflective materials on panels and trim for increased low-light visibility Stretch gusset panels Embroidered logos Integrated Armor System: D3O T5 EVO PRO XT hip and knee pieces included (exceed level 1 CE certification for pren1621-1:2011 testing) Poron XRD tailbone coverage VELCRO® brand fastener adjustment at sides of knees to cinch down knee armor Cargo, Comfort and Support Systems: 2 mid-thigh cargo external pockets Side waist adjustment straps Mesh comfort liner Over-the-boot adjustable boot cuff with zippered expansion panel and custom K snap closures Rubber coated buttons Updated VT10 YKK Vislon Aquagard water resistant zippers VELCRO® brand closures and elastic panel at waist High-back elastic waist Max Flow Ventilation: 4 ports 2 upper-thigh intakes 2 rear leg exhausts. The item "Klim Badlands Pants, Olive Green/ Black-sz 34 Regular" is in sale since Monday, August 6, 2018. 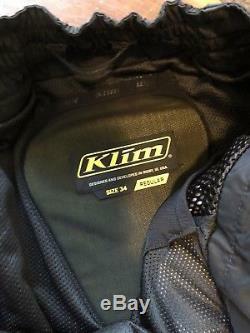 This item is in the category "eBay Motors\Parts & Accessories\Apparel & Merchandise\Motorcycle Street Gear\Pants". The seller is "jerod24601" and is located in APO, Armed Forces Europe, The Middle East, & . This item can be shipped to United States, Canada, United Kingdom, Denmark, Romania, Slovakia, Bulgaria, Czech republic, Finland, Hungary, Latvia, Lithuania, Malta, Estonia, Australia, Greece, Portugal, Cyprus, Slovenia, Japan, China, Sweden, South Korea, Indonesia, Taiwan, Thailand, Belgium, France, Hong Kong, Ireland, Netherlands, Poland, Spain, Italy, Germany, Austria, Israel, Mexico, New Zealand, Switzerland, Norway, Saudi arabia, Ukraine, United arab emirates, Qatar, Kuwait, Bahrain, Croatia, Malaysia, Brazil, Chile, Colombia, Costa rica, Dominican republic, Panama, Trinidad and tobago, Guatemala, El salvador, Honduras, Jamaica.